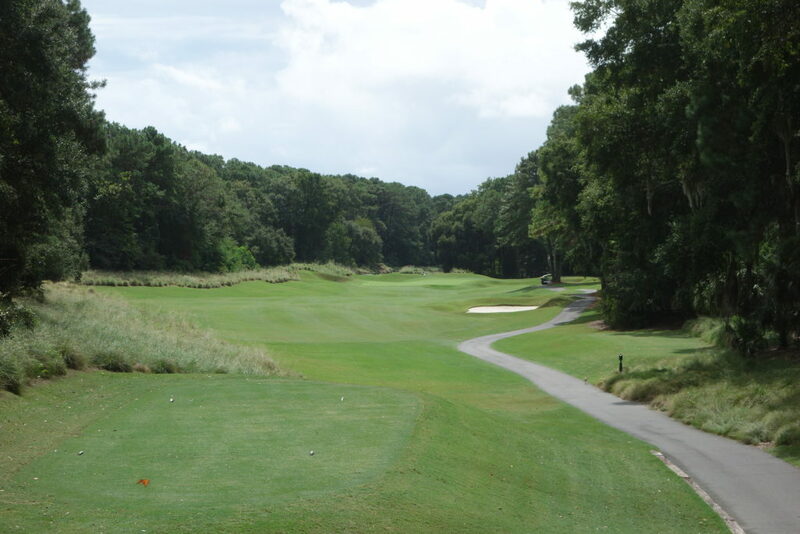 Long Cove Club is considered to be one of the best courses on Hilton Head Island. 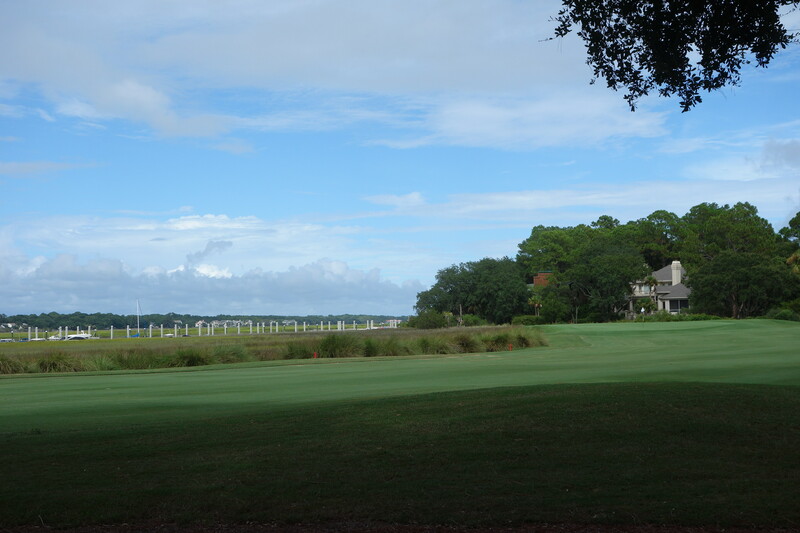 The private club was built in the early 1980s and it remains one of the most prestigious on the island. 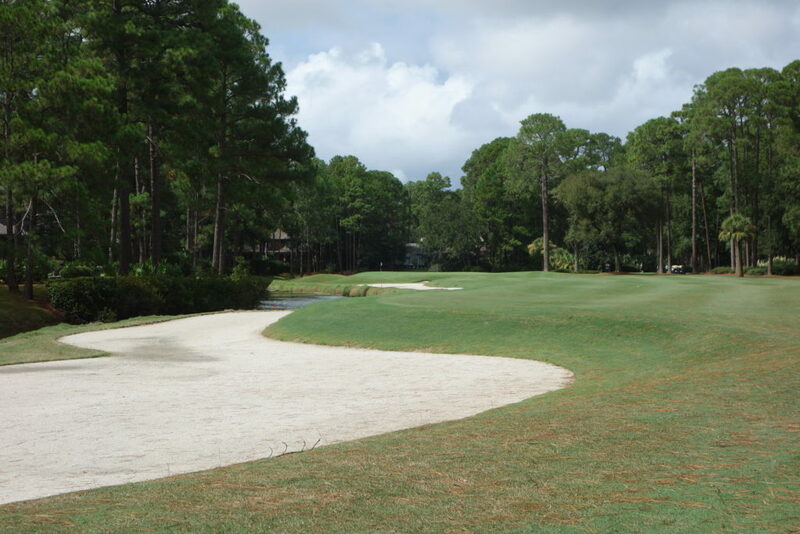 Pete Dye designed the golf course, which balances typical Dye challenge with a course that won’t dishearten a membership who play the course daily. 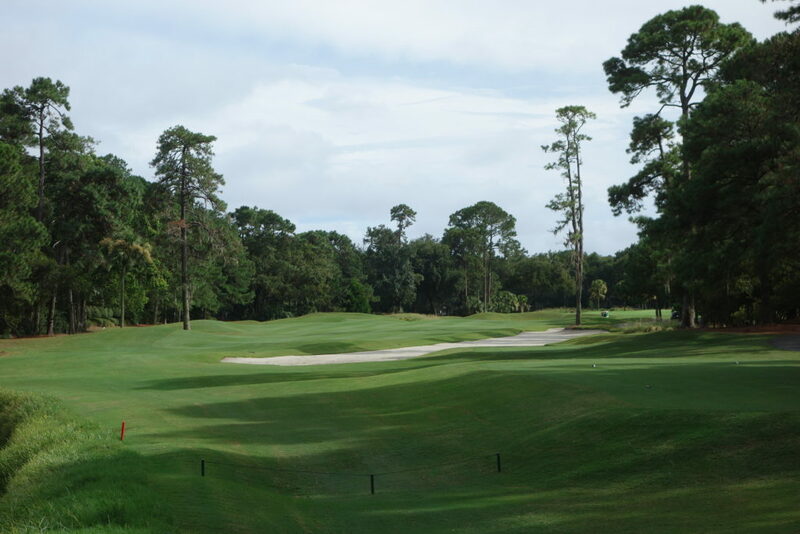 It is par 71 and reaches 7,000-yard from the tips with a rating of 74.9 and slope of 143. 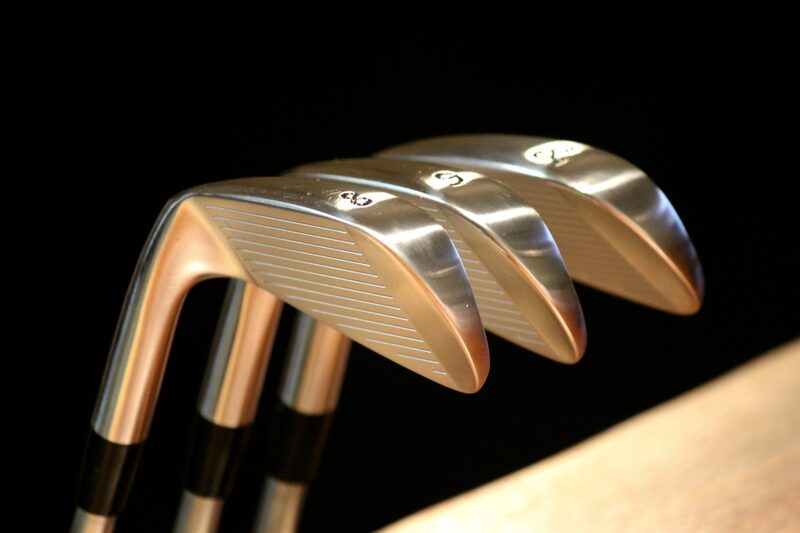 If you do step back to those rear tees, pray the wind doesn’t come up. 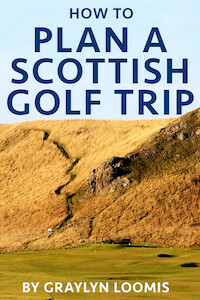 My opportunity to play the course came about through LINKS Magazine. We had our annual sales meeting and spent an afternoon on the course at Long Cove. The weather was iffy throughout the day, and you’ll see rain, cloud, and bright skies in the photos below. We had lunch in the beautiful clubhouse and headed out to the range to warm up before our round. 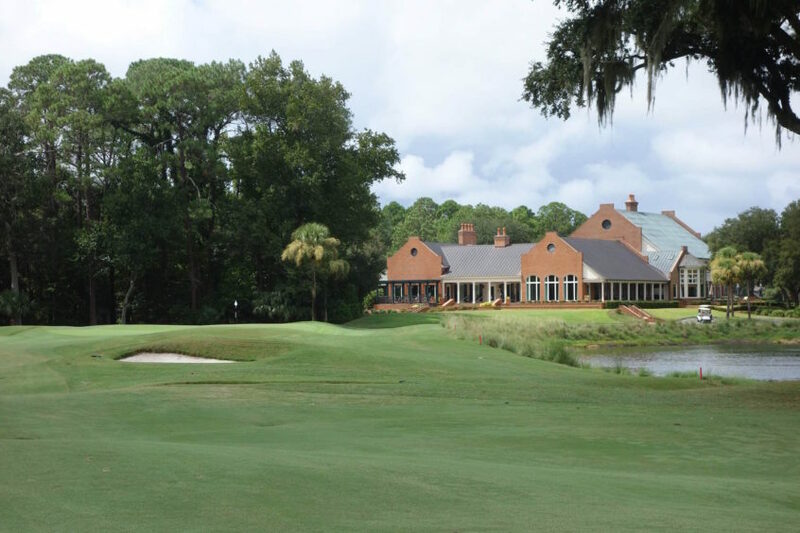 Long Cove naturally receives comparisons to Harbour Town, its Dye-designed neighbor in Sea Pines on Hilton Head. 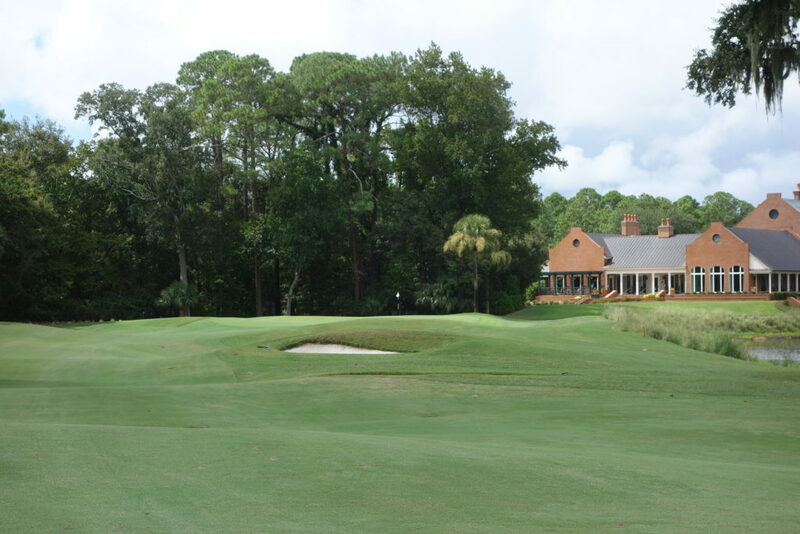 Long Cove is considerably more open than nearby Harbour Town, and like Doak said, it wasn’t designed to host PGA Tour events. 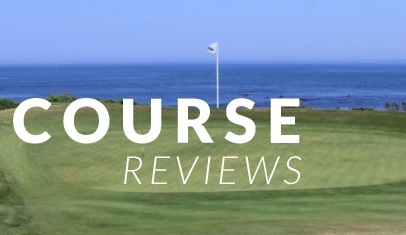 The greens at Long Cove stand out as particularly good, with great shaping and variety. Keep an eye on the greens in the photos below. For what was a completely flat piece of land, they look both natural and very interesting. 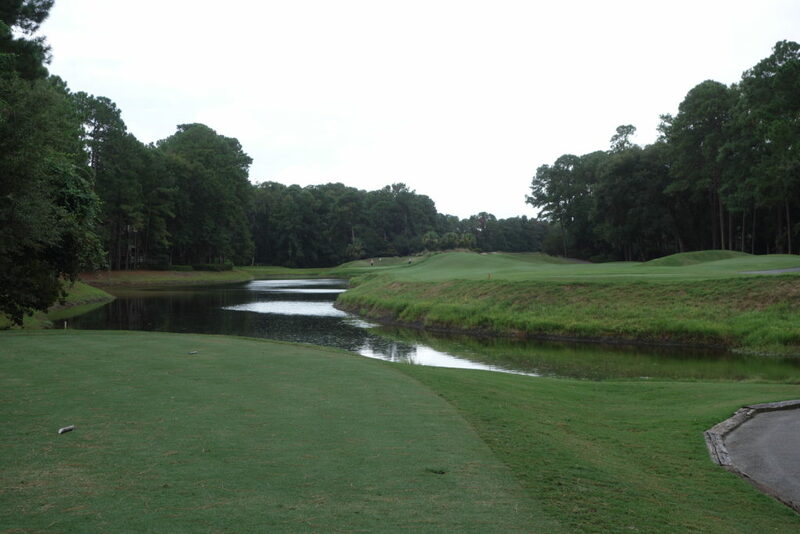 Hole #1 – 400 yards – Avoid the water down the right side of this hole. 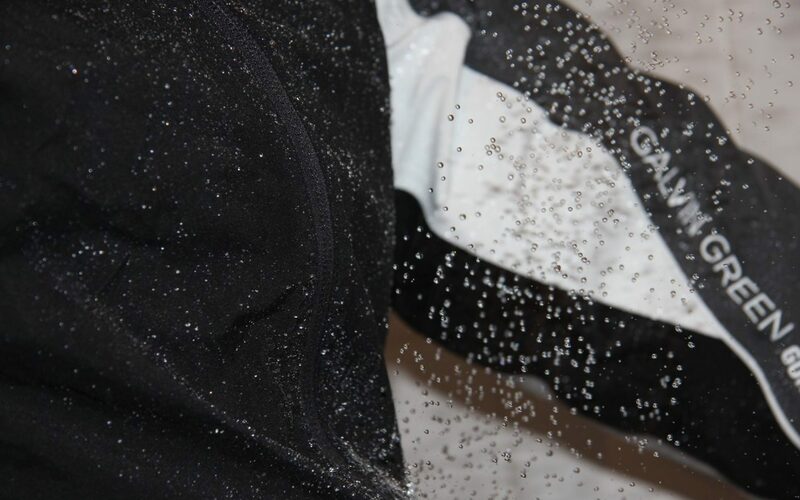 Fortunately a bunker bordering the water catches most errant right shots. 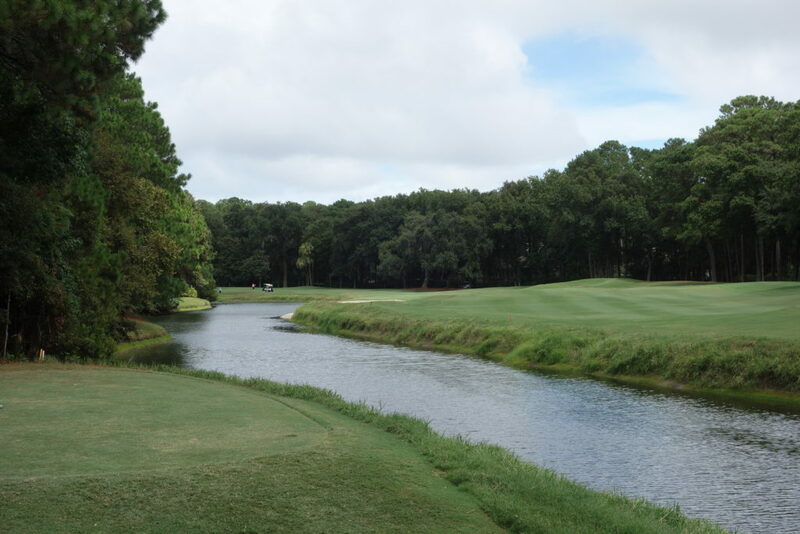 Hole #2 – 162 yards – This green is huge once you get up there, but the water on the left and tall grass on the right intimidate and narrow the hole visually. Hole #3 – 527 yards – Bigger hitters don’t have much fairway up there in between the rough and water. Not much is lost by laying back and playing this one as a three-shotter. 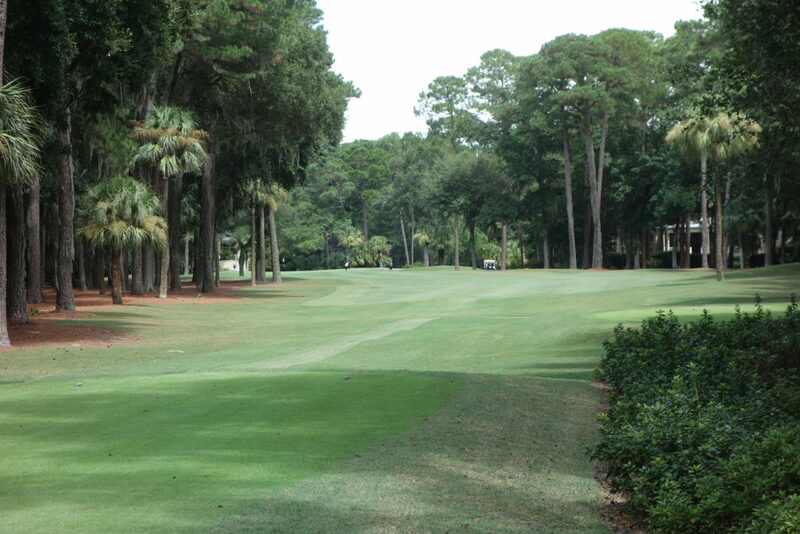 Hole #4 – 362 yards – This hole feels much more like Harbour Town, with trees that squeeze the hole and guard the green. 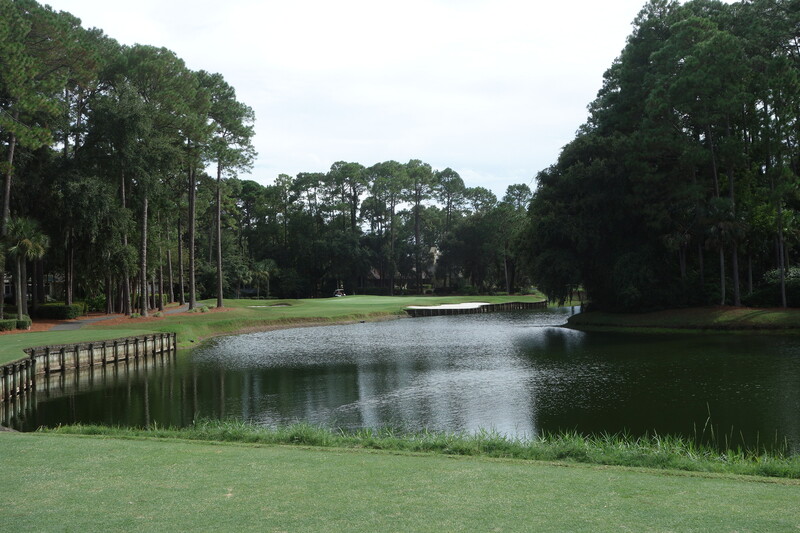 Hole #5 – 305 yards – This is the quirkiest hole on the course. You can see the green from the tee, but the approach is totally blind due to the mound you see in the photo below. 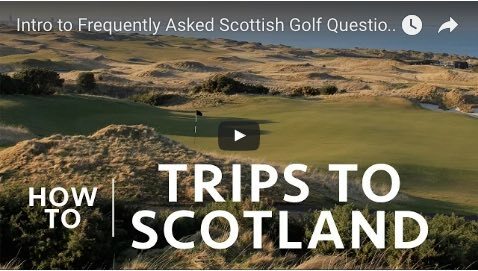 Big hitters can try to rip one here and get on the green, but the delicate play and a little local knowledge is the most common route. 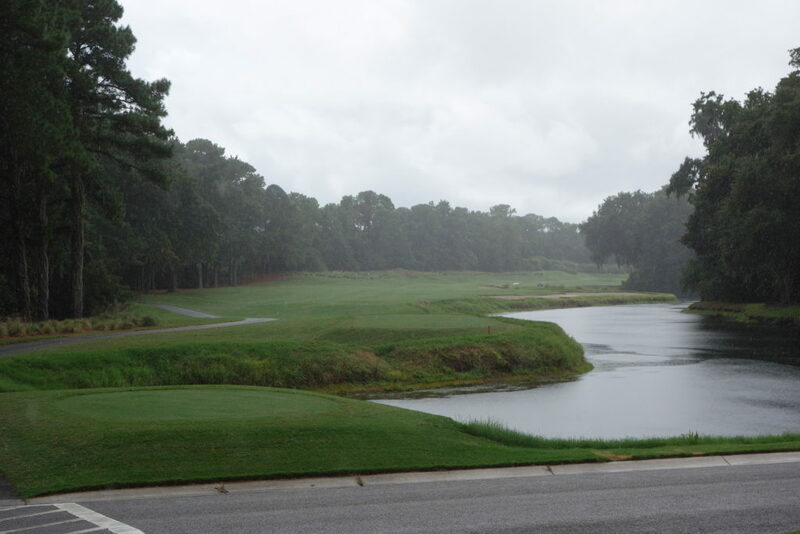 Hole #6 – 527 yards – The rain started to come down on this tee. 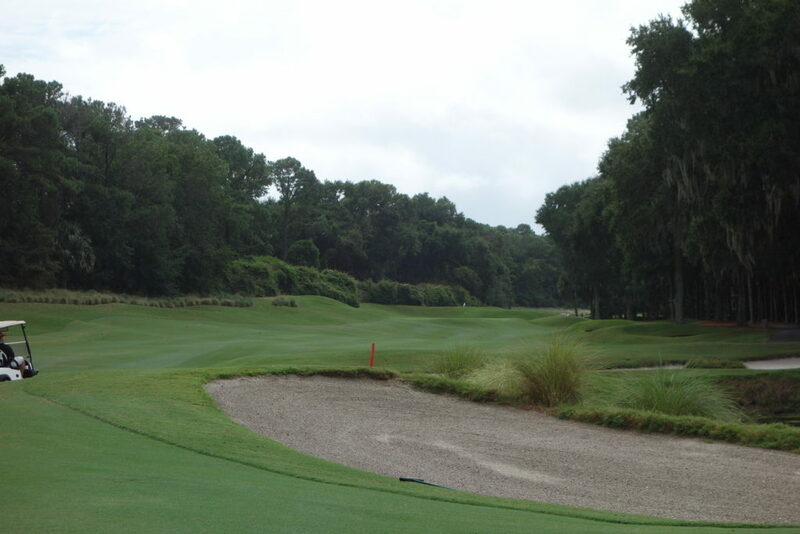 There is plenty of fairway out left and no reason to threaten the large waste bunker on the right. 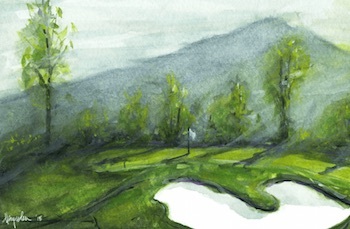 The green – one of my favorite on the course – sits beautifully on the side of a hill. 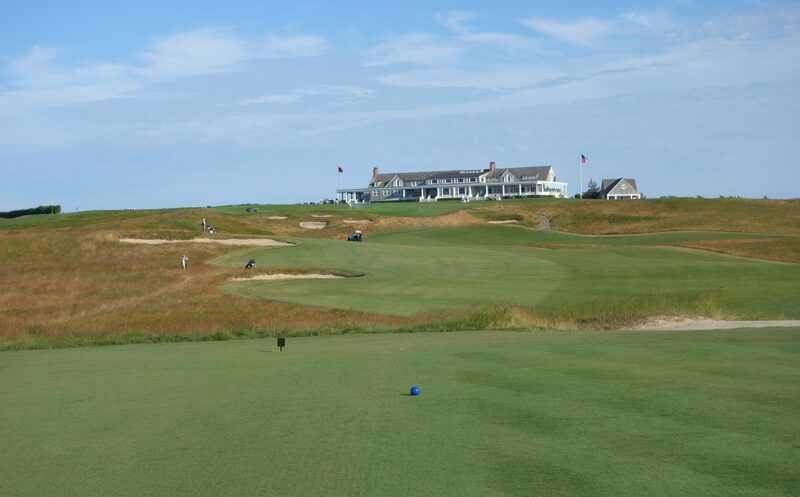 Hole #7 – 430 yards – If the last green was one of my favorite on the course, this is my favorite green of them all. 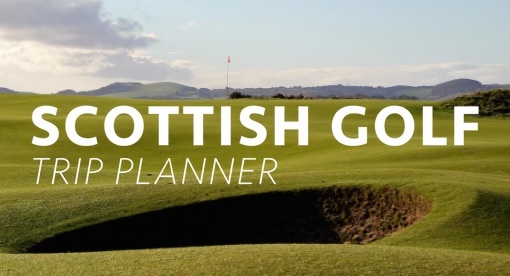 An open fairway leaves a mid-iron approach shot to this stunning large green. 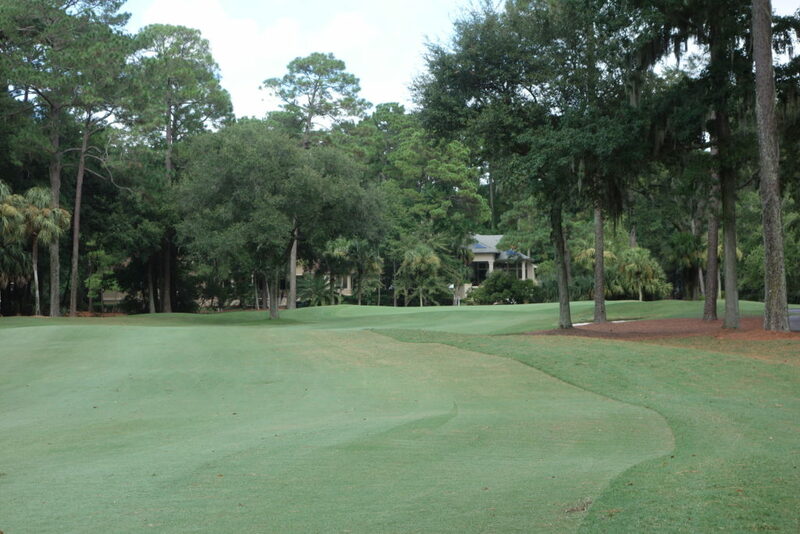 You don’t see many holes like this on Hilton Head, where trees and homes squeeze many layouts. 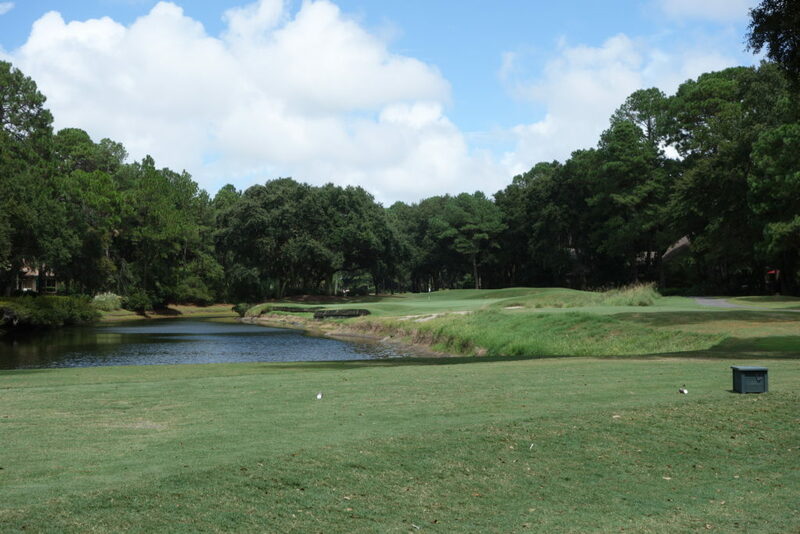 Hole #8 – 195 yards – A par 3 here with another massive green. On dry or firm days, the area left of the green will kick balls back to the right. 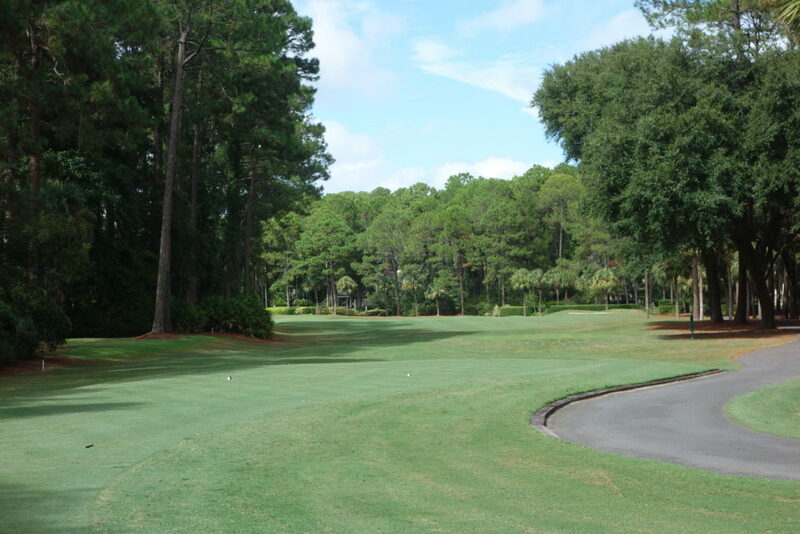 Hole #9 – 385 yards – A tee shot down the left opens up the approach to this green. 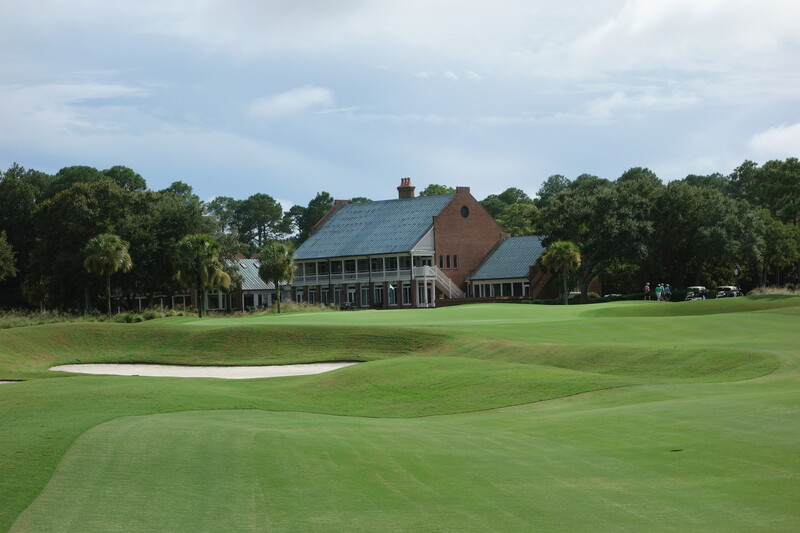 The hole is also framed nicely by the red brick clubhouse. 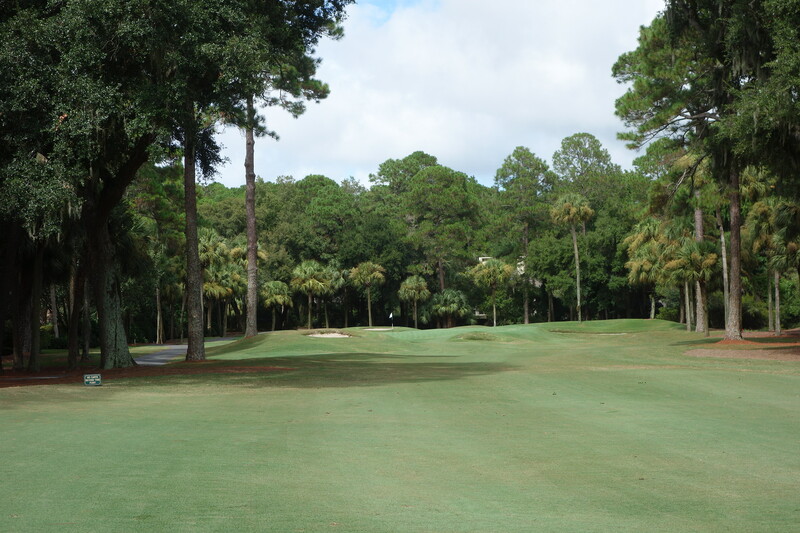 Hole #10 – 398 yards – Water down the left this time, but be aware of the trees tight on the right. In other words, be accurate here! 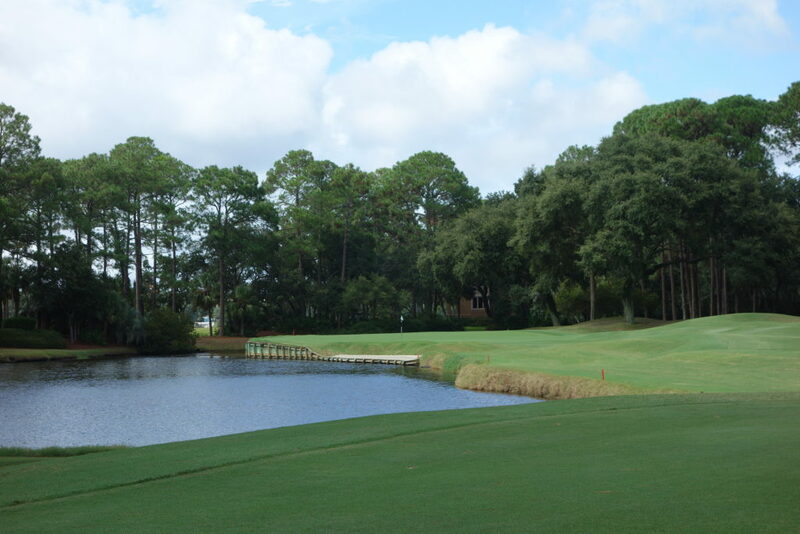 Hole #11 – 372 yards – Another tight green entrance a la Harbour Town. Slopes and small pot bunkers guard this green and that bunker you see on the left looks greenside, but is actually well short of the green. 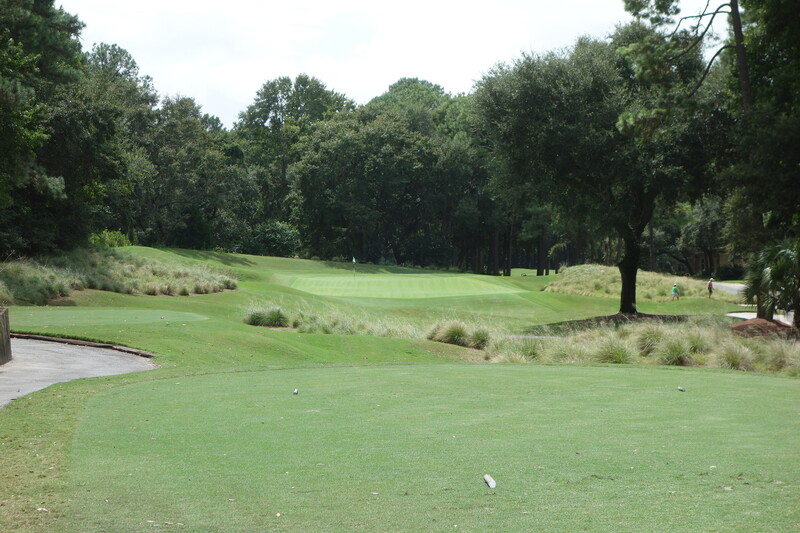 Hole #12 – 420 yards – I thought I was being clever here cutting off some of the corner, but nothing is gained. 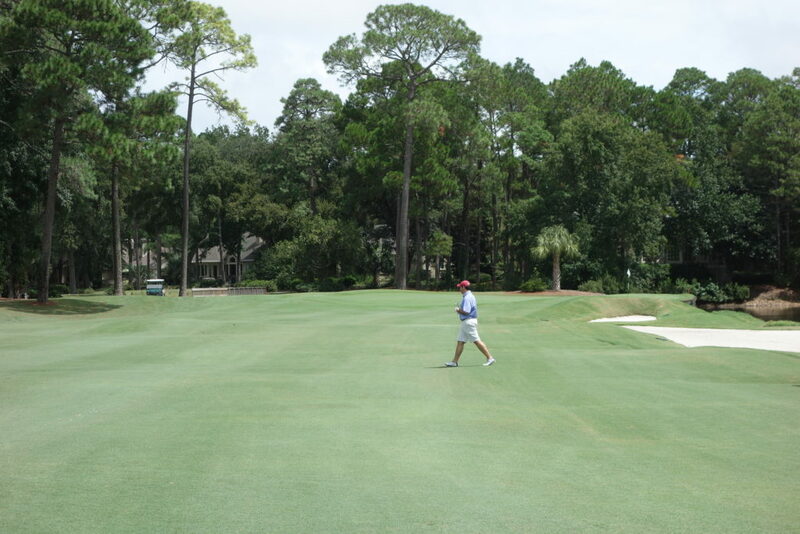 In fact, the right side is preferable to get a good angle into this green. 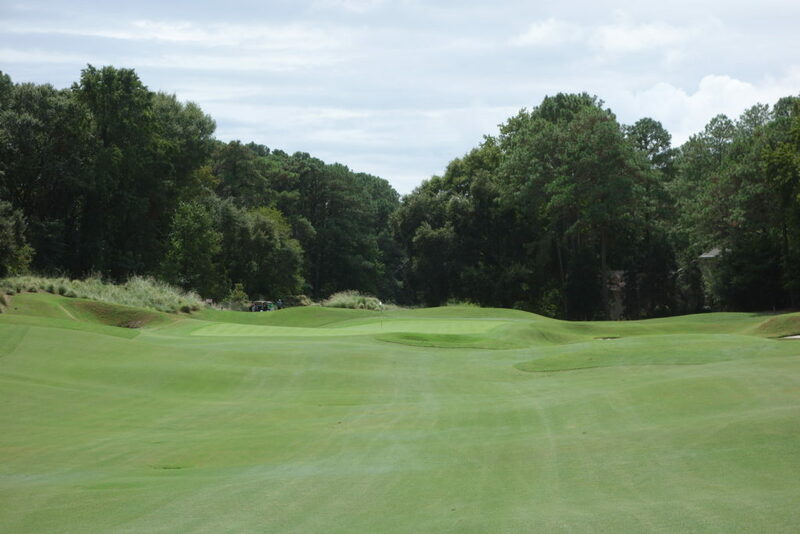 Hole #13 – 137 yards – These next two are the “signature” holes on the course. They both run along the marsh, looking back towards the South Carolina mainland. 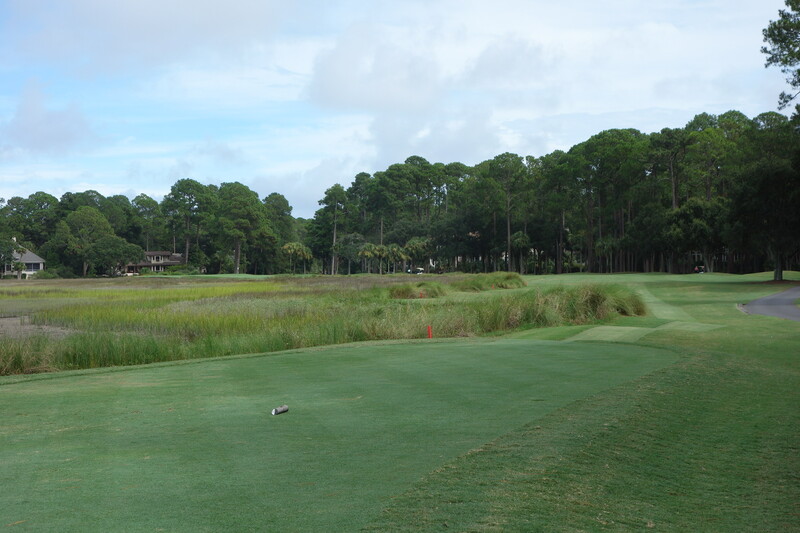 A wooden wall holds up the front of this green, so coming up short isn’t an option… As you can see in George Peper’s case below. 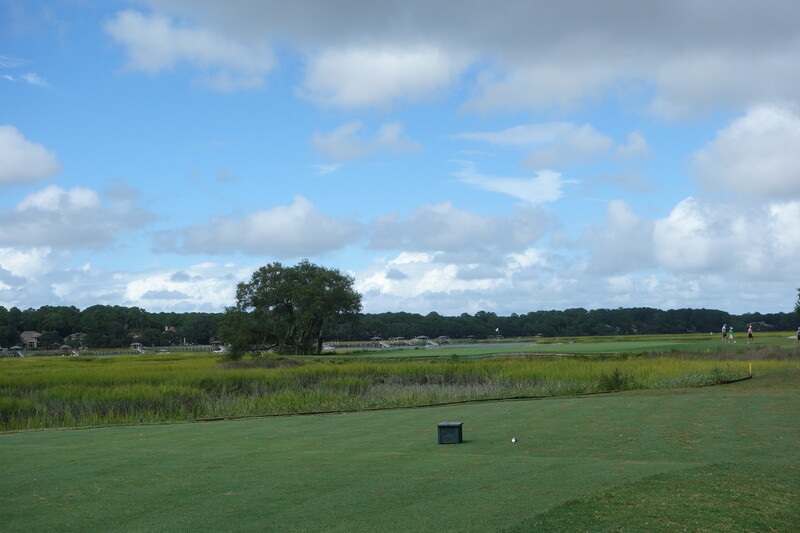 Hole #14 – 388 yards – This is a sweeping dogleg left, and when the marsh grasses are high, it looks like there isn’t a green or fairway out there! There is a stunning vista to the left here. 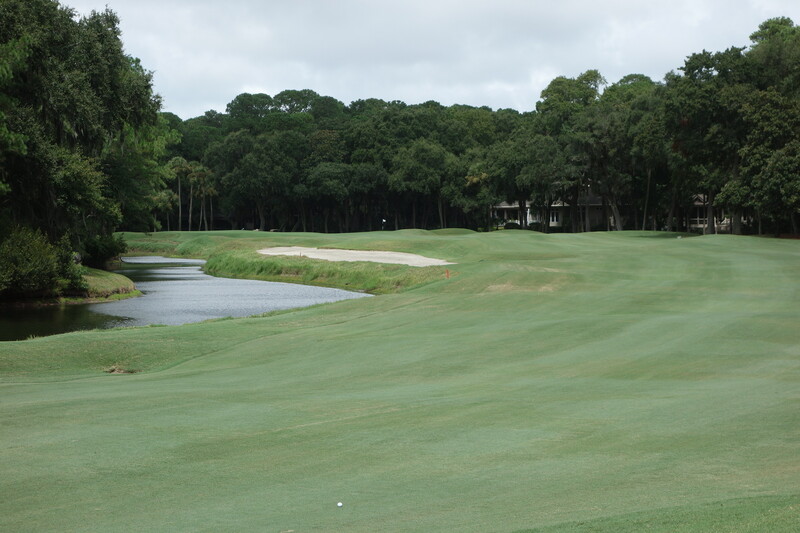 Hole #17 – 186 yards – Regardless of where the tees are, this takes a solid shot to reach the green. The putting surface is much larger than appears from the tee, fortunately. 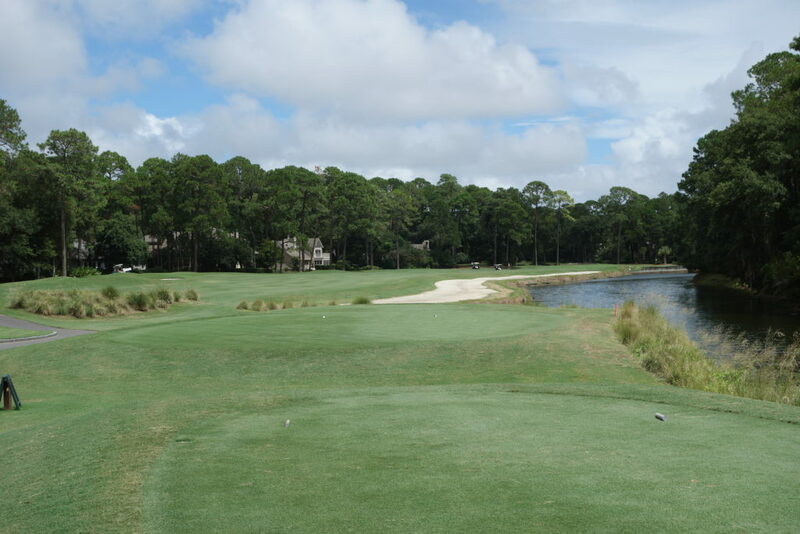 Hole #18 – 429 yards – The final hole is big, wide, and open, which makes the finish feel grand. The green is massive as well, and as with the 9th, the clubhouse frames the approach shot nicely. I have lived in the Hilton Head area for just under a year at this point, and I am finally getting around to playing many of the area courses. Long Cove has been at the top of the list for quite a while, and I wasn’t disappointed with the experience. Big thanks to LINKS for this one and to Long Cove for hosting!